Makes me wanna get out a shirt to splatter paint! I’m so excited about my daughter Poppy being in playschool! I really love fall. Though I must admit that one of the things I love most about fall now is watching everyone else head off to school while I drink my coffee in my house coat (and giggle). Poppy is settling right in with all of it. After doing a second pure orange painting, she is now back to doing more “detailed” works. 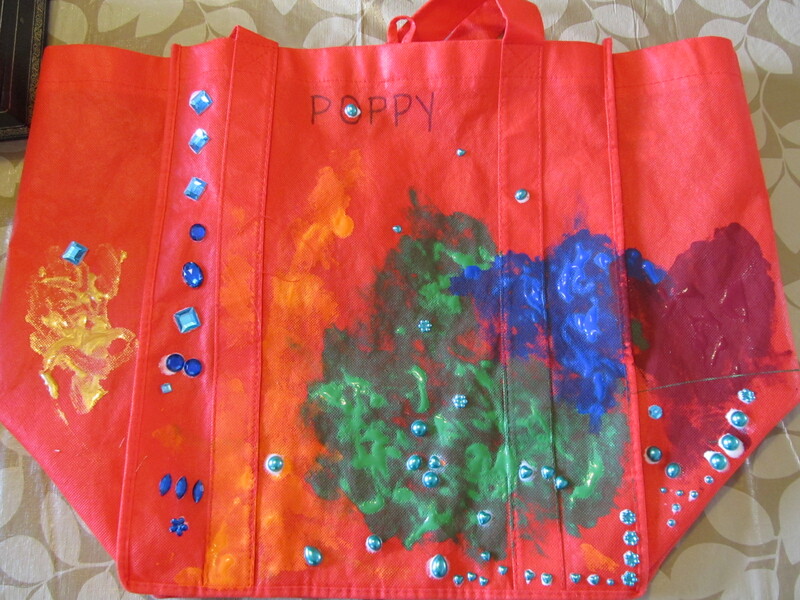 It started with her school bag that the playschool gave each child to decorate as they please at home. 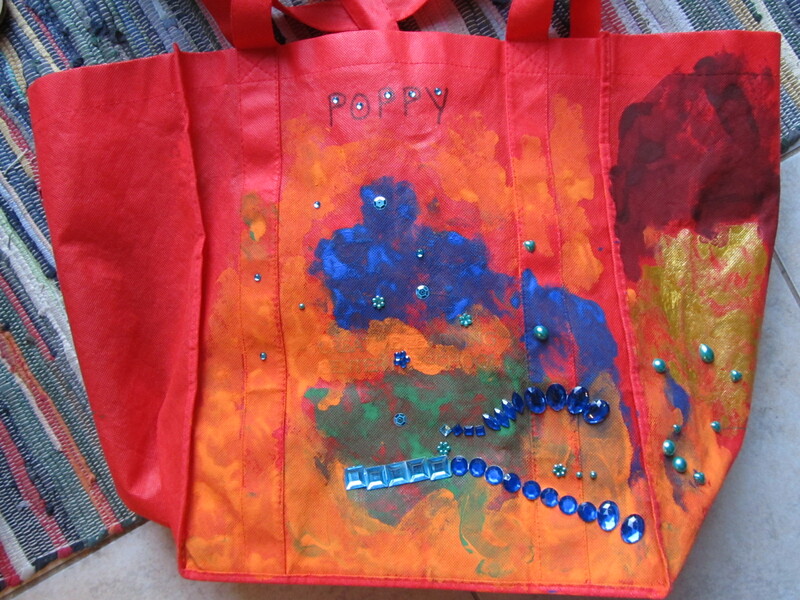 We went to the dollar store and picked out 5 fabric paints and some blue gems that Poppy fell in love with. For the most part we just let her go to it though I helped her to glue on the gems as she directed me with exactly where to glue them. 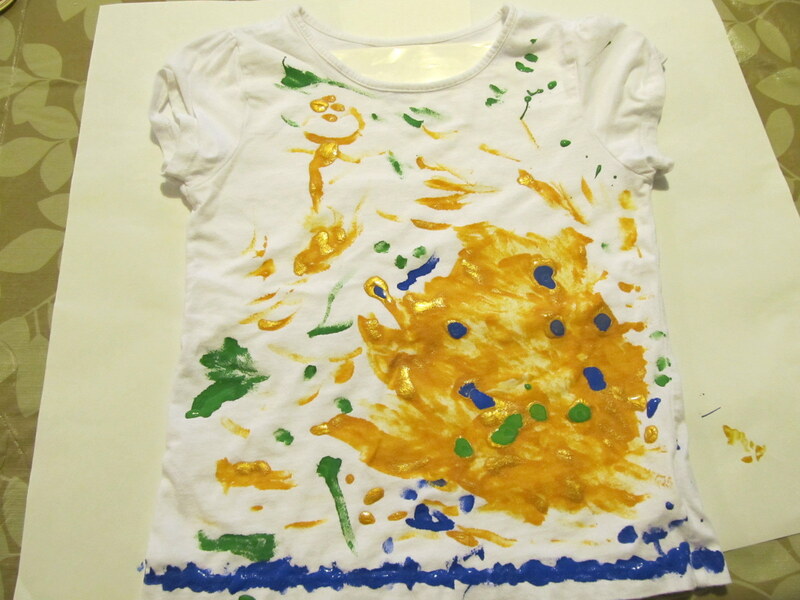 The next day she asked to paint another school bag, so I thought hey, why not one of those plain white shirts she has! She told me that this is a painting of a monster chasing birdies (the monster is the big blob, obviously). Poppy herself is also in the top left with green hair and green ears and large shoes. 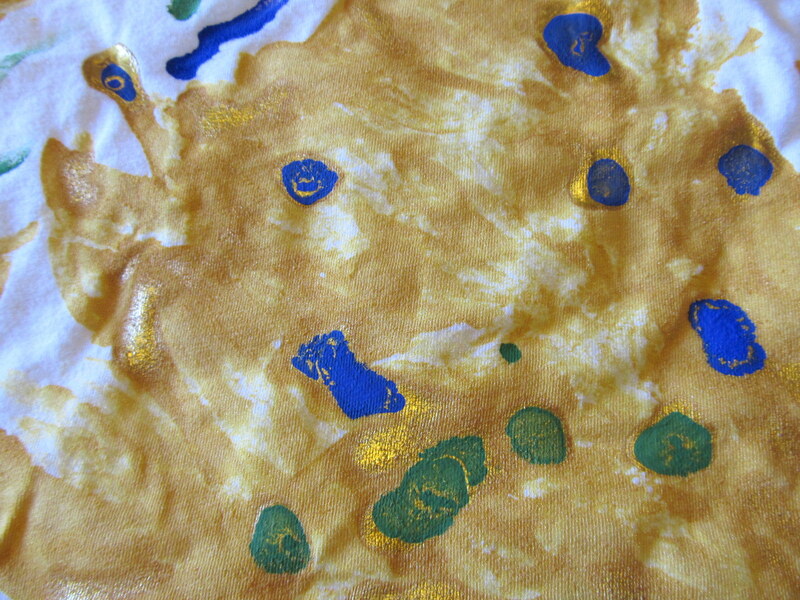 The feature colour in the monster, birds, and Poppy is gold with sparkles (not gold—but gold with sparkles). And I have to put a detail of the monster up because she made the blue and green dots by putting small drops of paint into areas where the gold paint had pooled. Phenomenal. I LOVE watching her paint! ← Watercolour Wednesday — Room with a view. Ah! The Puddle book! I need to buy that one! I’ve bought a couple of the mini Munsch books for her, I’ll have to look for that one.